InfraSteel, the nation’s leading culvert rehabilitation company, announces a new product line of culvert and bridge kits. Railroad companies and Departments of Transportation in states across the country use InfraSteel culvert and bridge kits to extend the life of failing culverts and for bridge rehabilitation. Culvert and bridge kits are available with mechanical head and wing walls to minimize the need for welding. InfraSteel, the nation’s leading culvert rehabilitation company, announces a new product line of culvert and bridge kits. Railroad companies and Departments of Transportation in states across the country use InfraSteel culvert and bridge kits to extend the life of failing culverts and for bridge rehabilitation. This summer, InfraSteel is installing a Bridge Kit in New York near the town of Onondaga. The tribal reservation of the Onondaga people is located near the city. The Onondaga was one of the original five nations of the Iroquois Confederacy in northeast America. 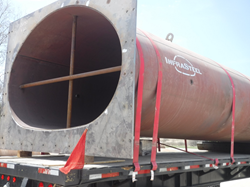 Precision Pipe and Products has developed InfraSteel to rehabilitate failing culverts and bridges. InfraSteel provides a new life expectancy of 50 to 100 years and is a cost-effective and environmentally friendly solution for the repair of failing structures without traffic interruption. For more information about InfraSteel’s culvert rehabilitation solutions, contact Cullom Walker at (205) 613-0072 or visit the InfraSteel website at http://www.InfraSteel.com.